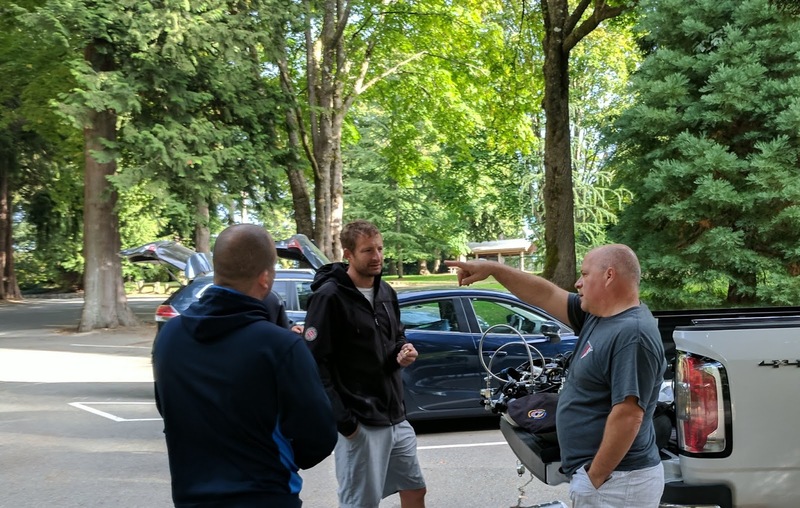 This year GUE-BC held a "mini" Wreck Fest in the Vancouver area as opposed to the Wreck Fest that had been held on Vancouver Island for the past few years. 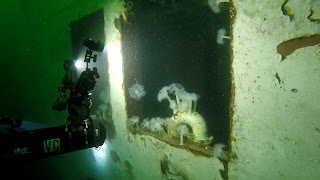 The idea was to get more cross-pollination happening, and get people onto the newest wreck, the HMCS Annapolis as well as the unique Sponge Bioherm. As always, we used the excellent Sea Dragon Charters, Captain Kevin and Jan! Day one was a perfect. The full roster was Jim, Liz, Nick, Francois, Michael Shapiro, Andrea, Zach, Myra, Vlad and myself. 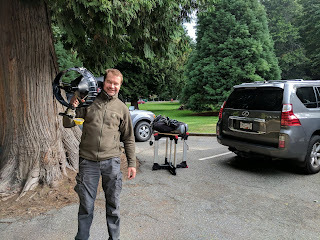 We had a lot of gear to get onboard, and Vlad took advantage of the carts. This picture was only a sample of what we brought on board. We were lucky to have the Topline, it could really fit a lot. 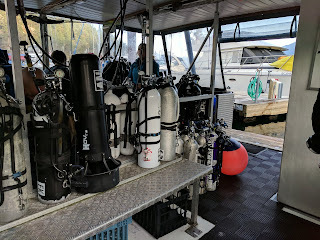 Normally you could have at least 18-20 people, so we had room with our 10 even with scooters, extra sets of doubles, decompression gas, and stages. 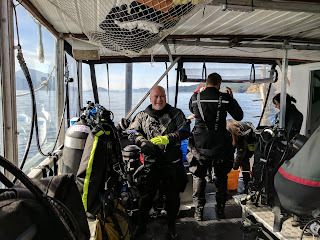 You can't get away without a bunch of happy diver pictures! 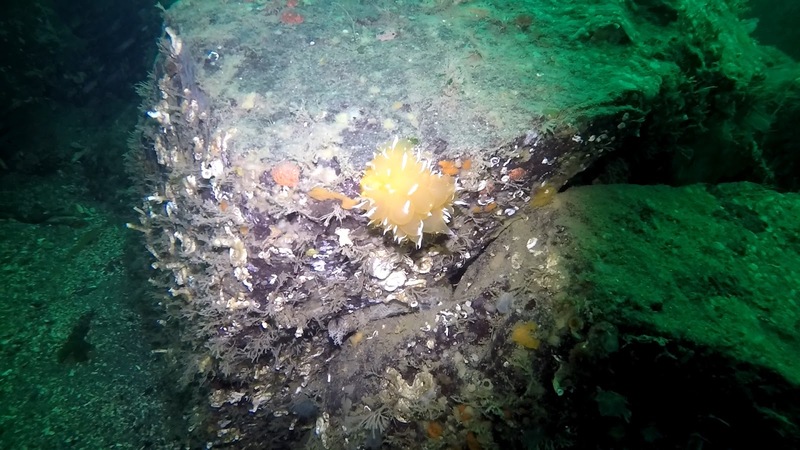 The first dive was on the sponge bioherm close to Halkett Wall. 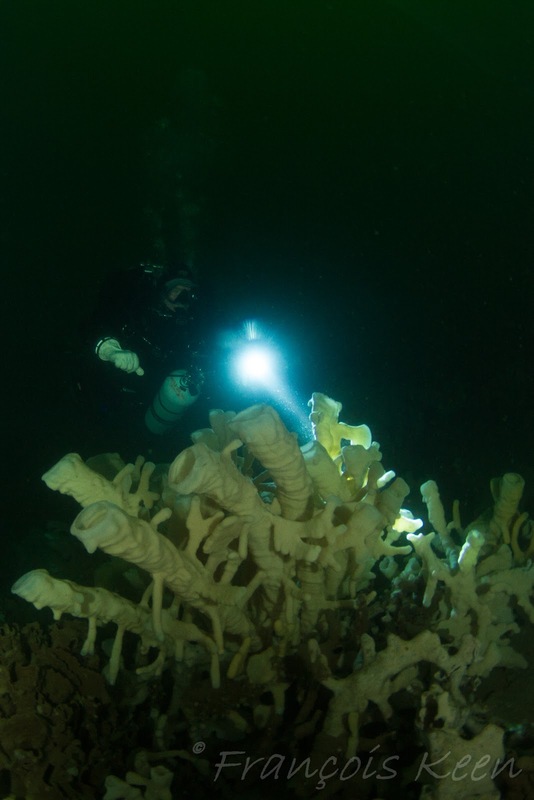 It was one of the few sponge reefs that could be reached by scuba (the others being 400+ meters). 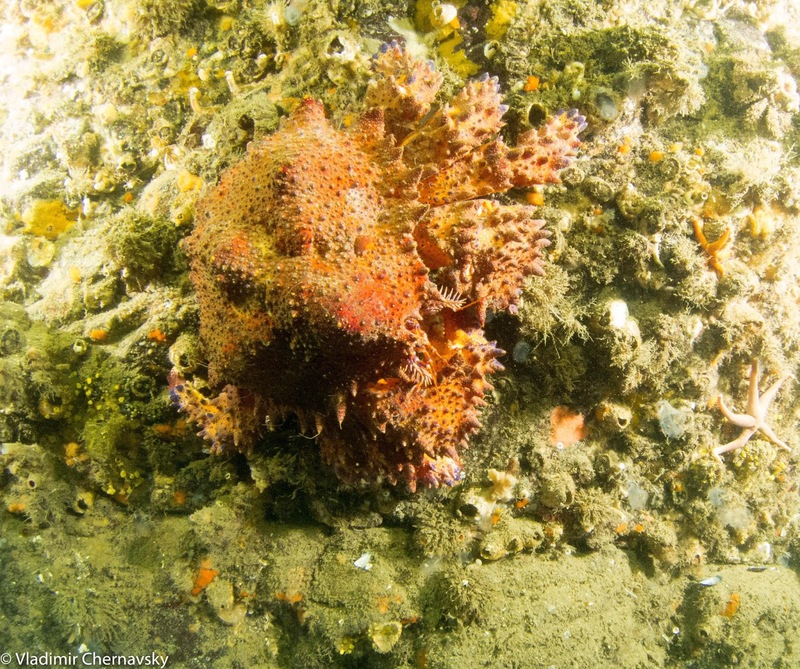 It was affectionately known as "Spongebob" and was only dive-able at certain times due to tide, current and weather. 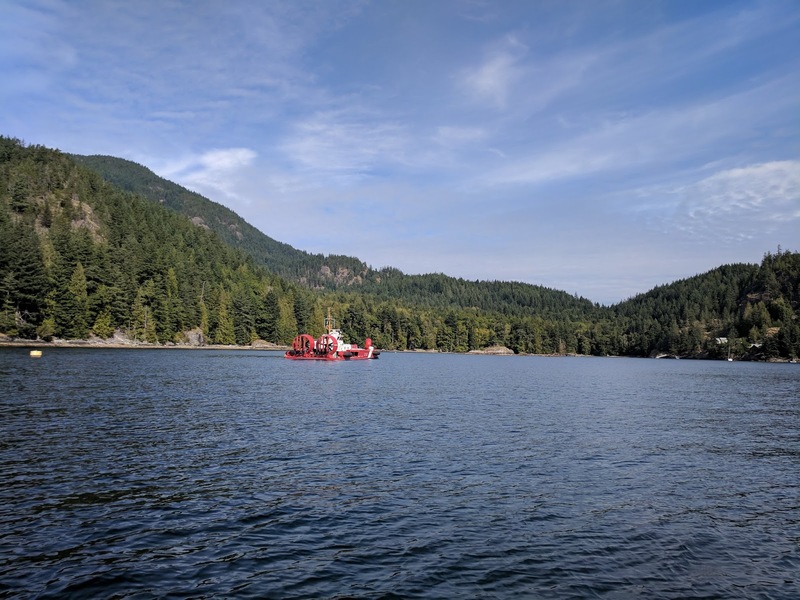 There was no place to tie up, so it was a live boat drop and recovery. 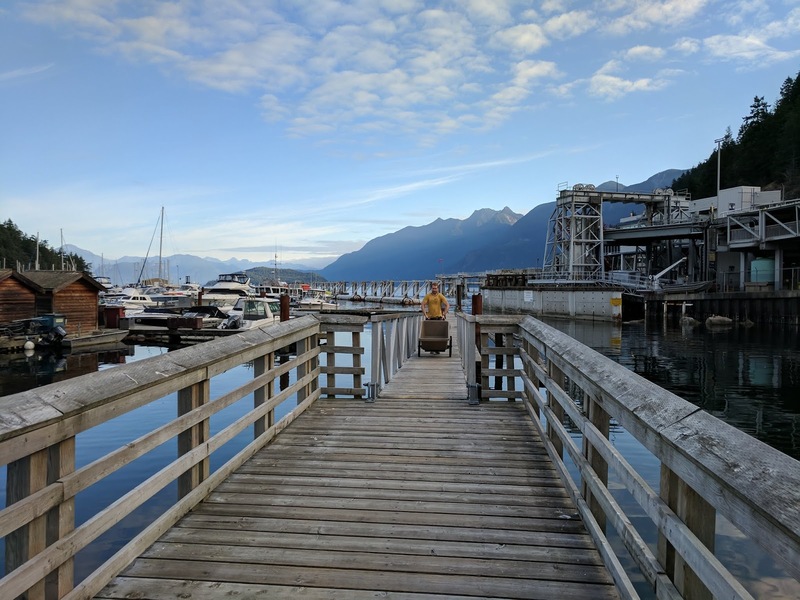 Also, it was in the middle of Howe Sound so boat traffic could be a real issue, especially when dive teams had decompression obligations. Today was perfect though. 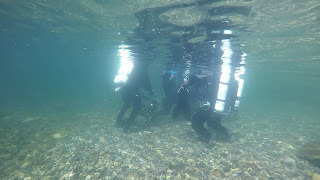 There was surface current but it was not bad at all, and it was easy to stay in place on the ascent portion. There were three technical dive teams and one recreational. Here was a great photo from the rec-team courtesy of Myra. It really shows the size and beauty of these sponges. I was diving with Francoise as part of the technical teams. I forgot just how much of the bioherm was accessible at recreational depths. 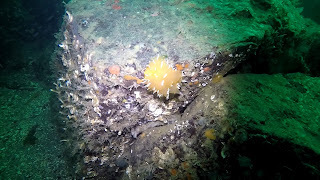 When we reached the bottom we were around 30 meters, and the sponge mound beside us kept going up to at least 25 or even 21 meters. It actually took some effort to find our deeper depth! On my next dive, I would remember not to go north east around the mound. That led to a shallower saddle area of mud. For a tech dive, it was much better to circle around to the north west side. However, this would only work if you are dropped on the south end of the mound. On all my previous dives, this was where we were dropped. It would be interesting sometime in the future to get to the north portion and check that out too. I was diving with Francoise, and once we were at our target depth of 45 meters, it was magic. 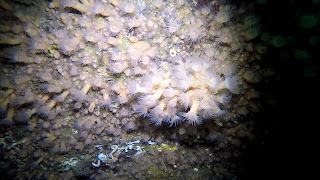 I had forgotten just how different the sponges were on the bioherms. Many of them looked like melted wax candles. And they were indeed huge! Francoise had his camera and got a great photo of me over one of the sponges. Unfortunately even in this remote place, there was evidence of humans. A big reason to study and document the sponge reefs was to document the impact on an environment that few ever see, let alone know about. Any area that was not directly visible could easily be affected by ignorance. A case in point was this derelict crab trap sitting on the south west side of the bioherm at about 42 meters. 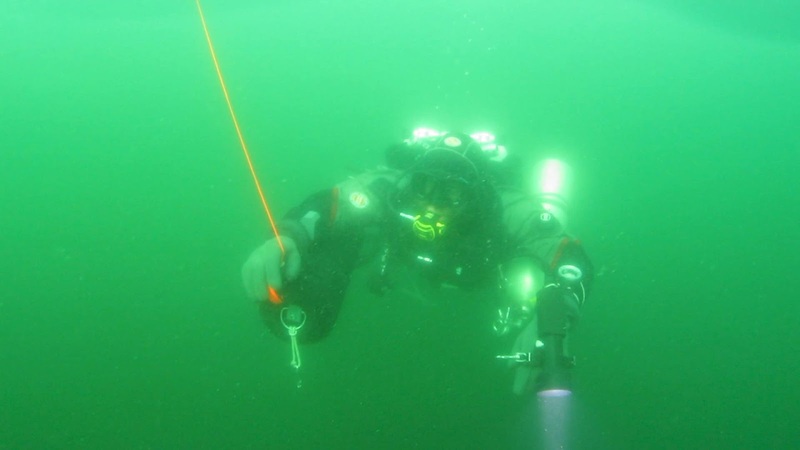 Vlad and Nick reported that a line ran from it to another trap further down. 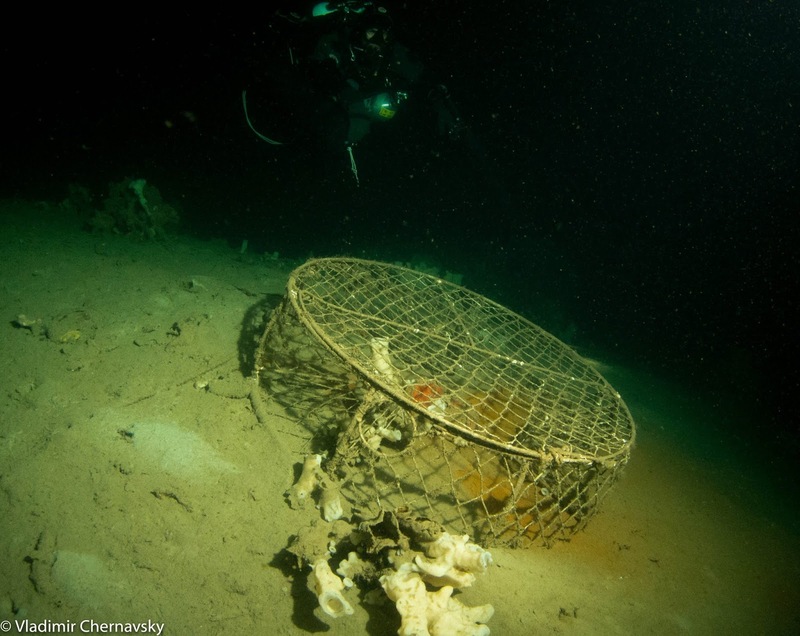 These crab traps were a good target for a ghost-fishing cleanup exercise in the future. On a lighter note, I spotted several Peltodoris lentiginosa or freckled sea lemons. 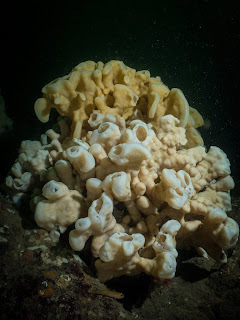 They were at least as big as my hand, and were cool in that they were one of the few things that actually ate glass sponges. 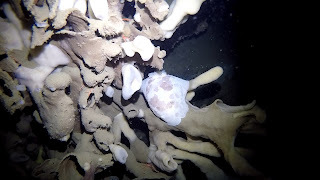 In the linked article, I learned that "this was the first documented instance of animals feeding on glass sponges outside of Antarctic waters". Pretty cool for our back yard! Here was a picture of one eating its lunch. 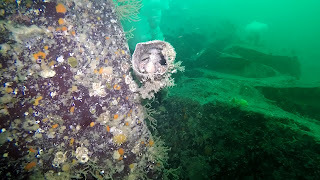 The sponge reef was home to wide array of other life, such as copper and quillback rockfish, along with several juvenile yellow-eye rockfish, distinctive with their horizontal white stripes. 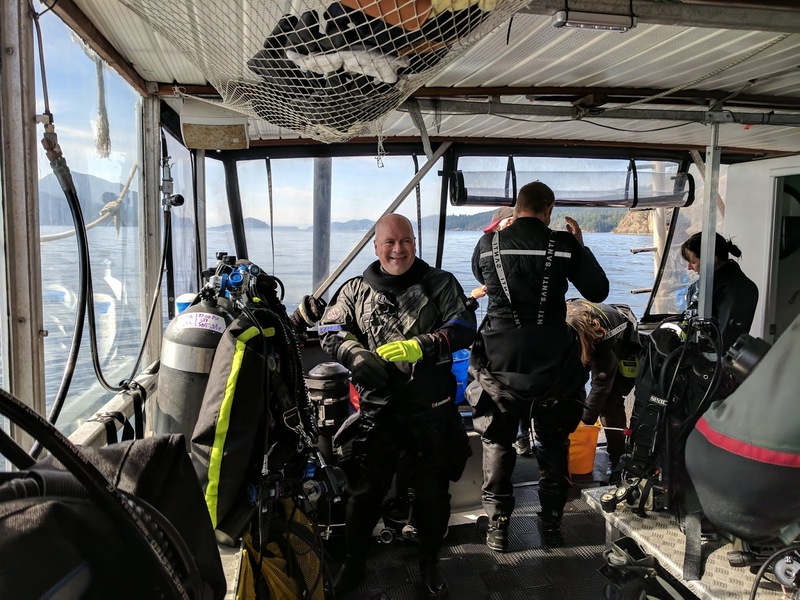 I submitted the rockfish I counted to the Vancouver Aquarium for this year's Rockfish Abundance Survey. And this was from Francoise's perspective. It was funny that they took pictures at the same time! Pretty soon our bottom time was over, and it was time to do our deco. I found the shot line at the end of our dive, so our deco was even easier. 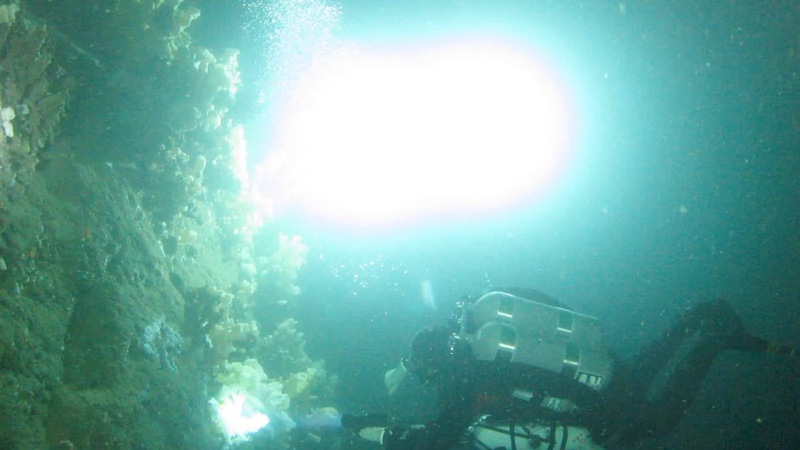 We still deployed an SMB as part of our dive plan to notify the boat that we started our ascent. Francoise didn't quite get enough air inside, so ours spent more time below the surface than on. Vlad got this picture of Nick to show what the 30 or so minutes of deco looked like. 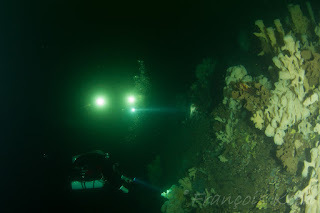 I was quite surprised that at 6 meters the visibility was so cloudy. 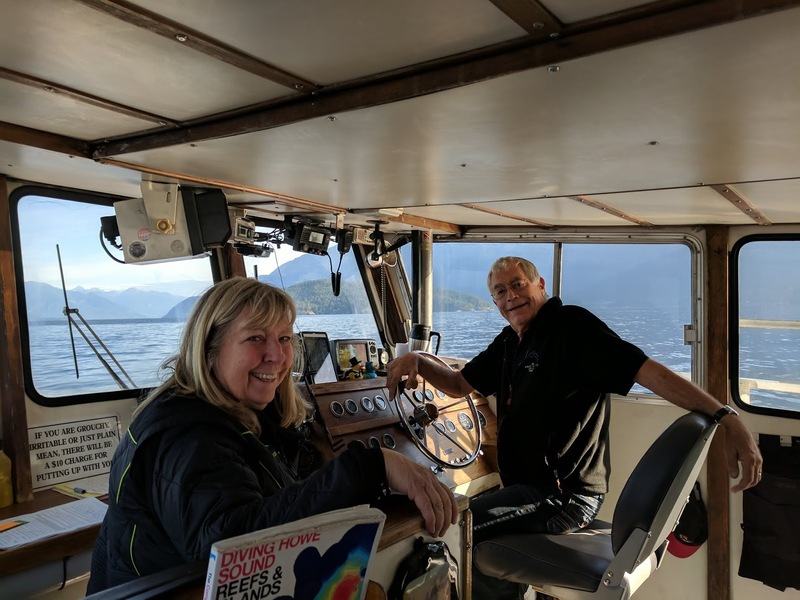 Back on the boat, we had a nice relaxing surface interval. 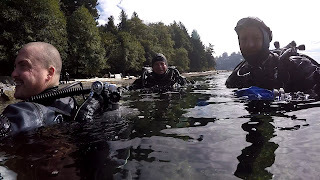 Vlad and Nick decided they needed more in-water time! 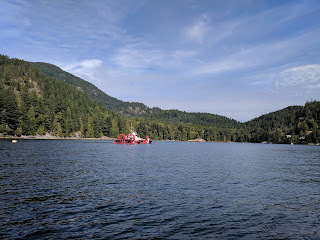 The Coast Guard hovercraft was also at the HMCS Annapolis doing some diving. For the Annapolis dives, we had recreational dives, scooter dives, and penetration dives. There was a lot going on! 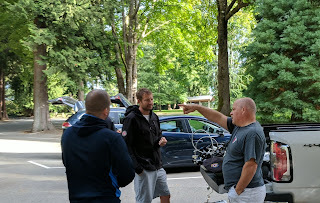 I was scootering with Vlad and Nick, and we had an excellent time. We visited Project Baseline Station B first. Vlad replaced some of the rusting metal bits with zip-ties, and I did a quick visibility measurement. Station B was away from the ship, and it was really silty in that area. It was a real challenge. Vlad got a picture of Nick adjusting the station some. 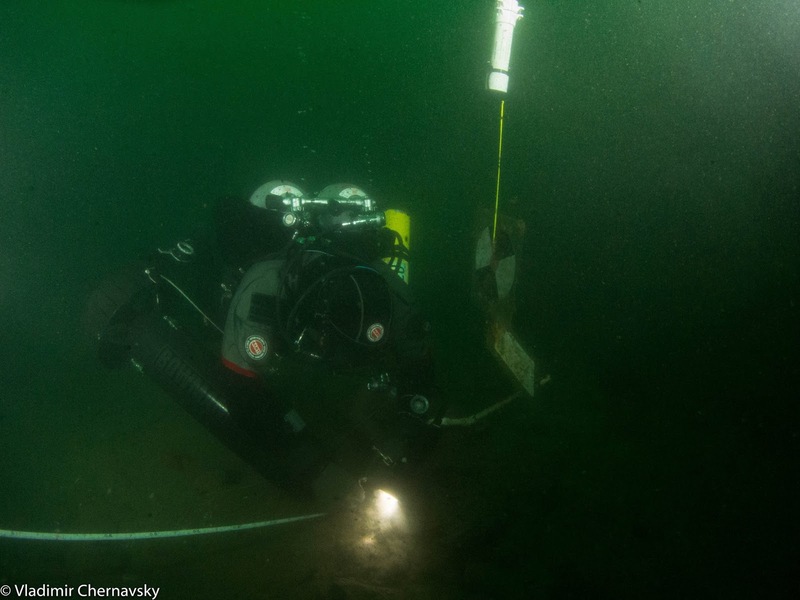 In the top of the frame was the temperature sensor that Vlad and I had deployed a week before. Unfortunately I had forgotten the float that had come loose the last time, so we were not able to repair that this time. 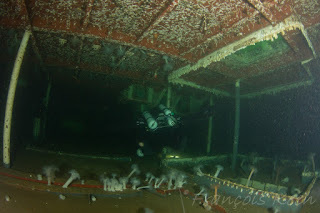 We spent the rest of the dive just playing around the wreck. We were nipping up and down the breeze-ways, through the swim-throughs, and in and out of the mortar bays. Francoise snapped a great picture of Jim entering the wreck and us scootering above. The growth of life on the Annapolis just continued to increase. 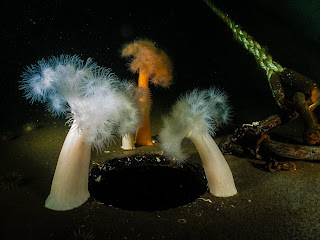 In the last year or so the plumose anemones had really gotten both large and numerous. 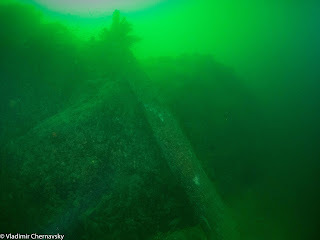 They were also starting to establish inside the wreck as well. Here, Francoise got another good picture of Jim and the inside. Outside was impressive too. I snapped a picture of Vlad lining up for a shot of some anemones at one of the cut-outs. Myra got another great picture of the pretty plumose anemones near the bow. Truffula trees from Doctor Seuss anyone? Too soon, it was back on board and heading for home. 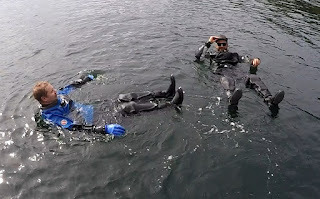 Kevin and Jan had a snorkel tour going out, so we had to get back pretty fast. 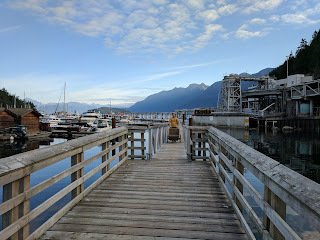 Once we had everything packed up, most of us got together for a bite to eat in Horseshoe Bay. It was a perfect end to a perfect day; good friends and good food. But, we weren't done yet! 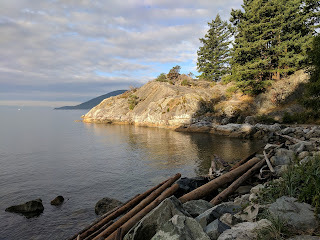 On the following Sunday, we had dives set up for Whytecliff Park. Unfortunately, only Jim, Francoise, Vlad, myself and Dennis were able to attend. 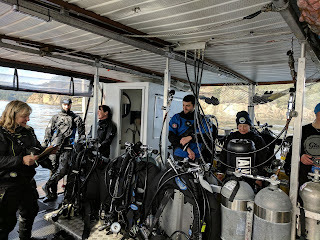 Still, it was another great day for diving. Vlad and I did a scooter dive out past the Cut, and also ended up meeting Dennis, Jim and Francoise at the Plumose gardens on the way back. Vlad and I went to try and find the strawberry anemone patch we had discovered the previous Wednesday, but were unsuccessful. We sure saw a lot of other great things though. The highlights were huge patches of Zoanthids, golden dironas, a very photogenic decorated warbonnet, a puget sound king crab, and huge schools of perch and rockfish. I was most impressed with the number of nudibranchs. On the previous Wednesday, I didn't see any. 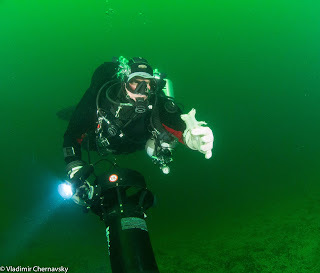 On this dive, I saw over ten. 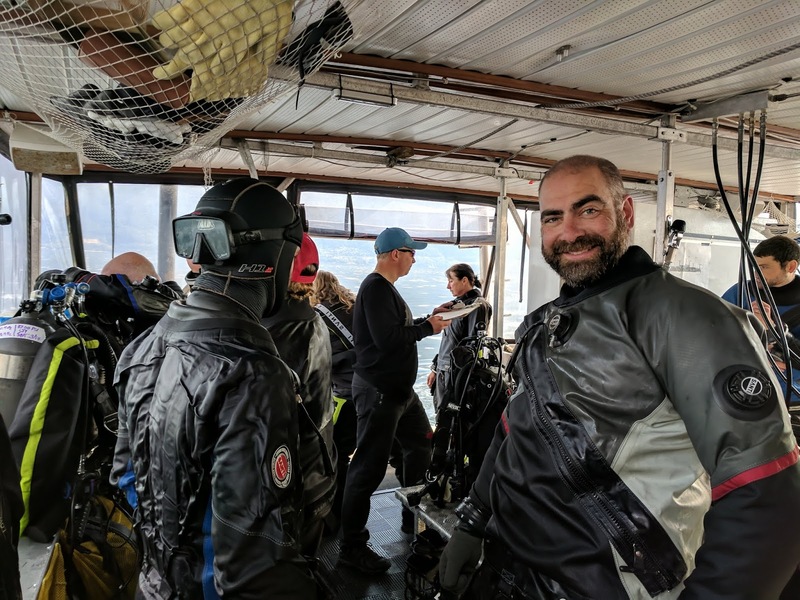 We had a deeper dive profile on the Wednesday dive, so that could have been a factor. 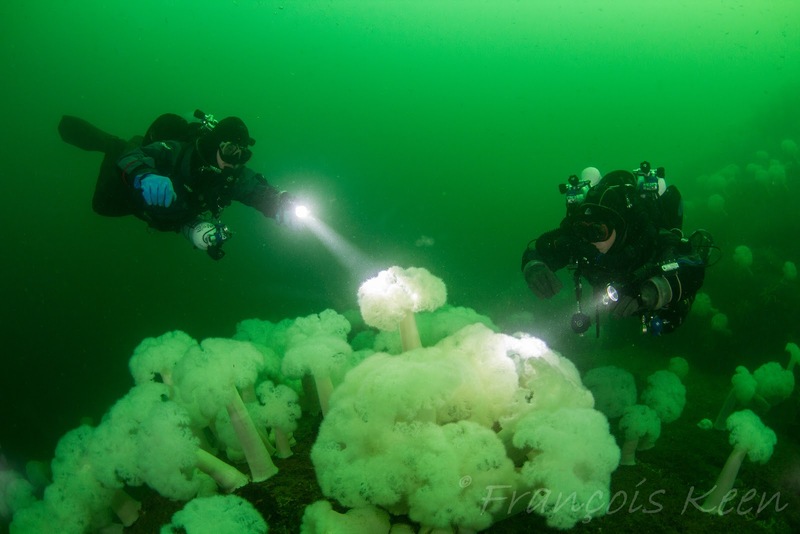 If so, the nudibranch activity was centered around 15 to 20 meters. While scootering along, we noted a really big tree lying perpendicular on one of the rock walls. It was a bit eerie, like a ghost tree. 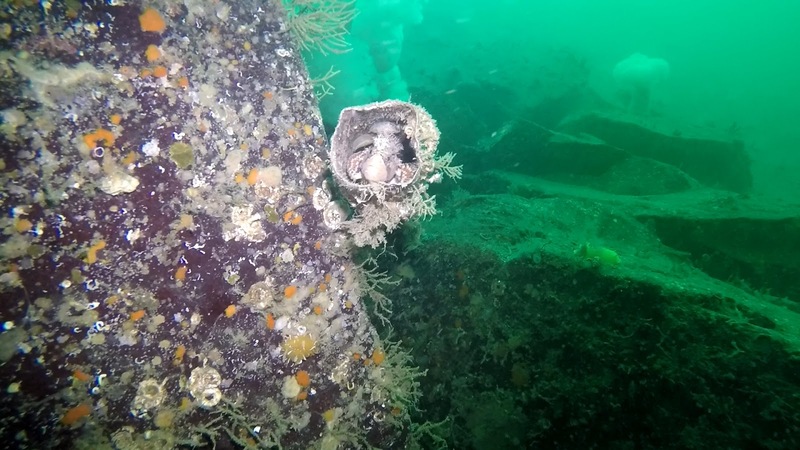 We also found the remains of a fish, but were not sure what kind. I would have to ask the Aquarium for some help on that question. 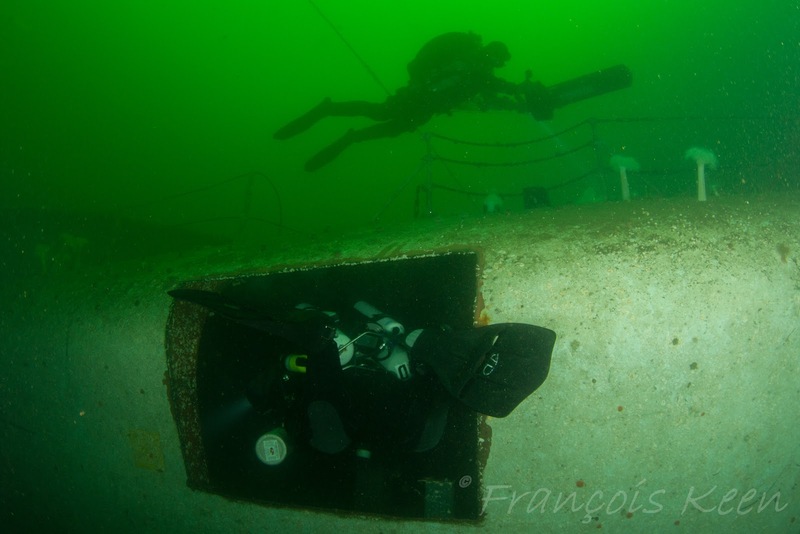 Francoise got some excellent pictures of their dive. 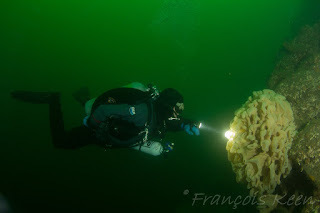 Here was Dennis checking out a cloud sponge near the Cut, with great trim. And another of Dennis and Jim checking out the Plumose gardens. 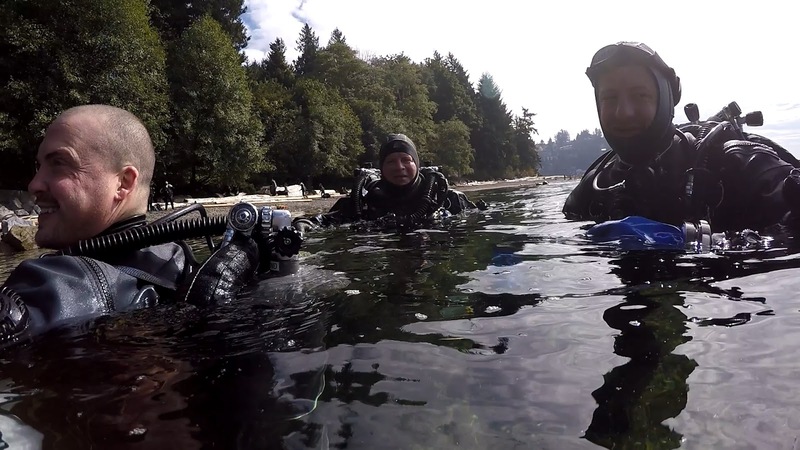 At the end of the dive, I snuck up behind Dennis, Jim and Francoise and got a picture of the happy divers. It had been a lot of work to organize, but the weekend went off without a hitch. Thank you to everyone who came and made it a success! Last but not least, here was the video compilation that I put together.